Young people who would like to move overseas to advance their careers say China and the United Arab Emirates (UAE) would be their top emerging market destinations, according to a World Economic Forum survey. 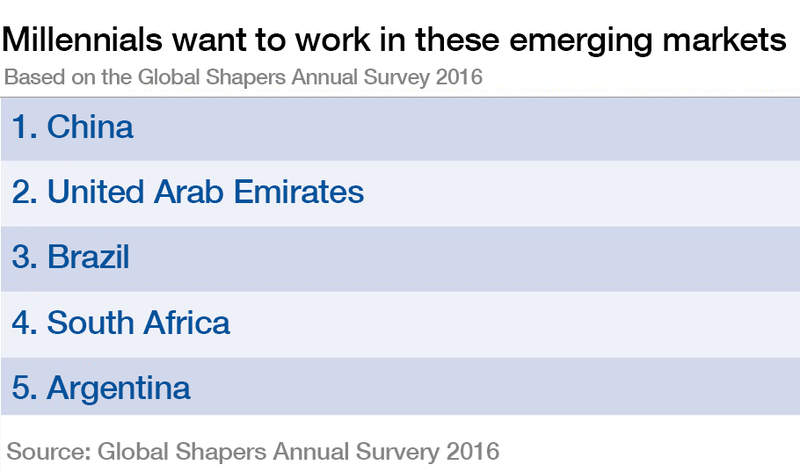 This is the second year in a row that China and the UAE were the favourite emerging markets for career progression among millennials who took part in the Forum’s annual Global Shapers survey . Brazil was next, followed by South Africa and Argentina. Globally, taking into account every country and not just emerging nations, China and the UAE were in 11th and 12th places respectively, ahead of all Scandinavian countries and Singapore. The US, UK and Canada lead the global list . Strong job prospects could explain the UAE’s popularity among Gen Y’ers. Around a third (34%) of respondents globally identified the lack of economic opportunity and employment as one of the three most serious issues affecting their country – making it the biggest issue of concern behind corruption. In the UAE, only one in 10 of local respondents saw unemployment as a serious issue. Another reason may be that, globally, millennials still value salary (54%) and career advancement (46%) over a sense of purpose and impact on society (37%) in their jobs. While a sense of purpose is the top priority among millennials from Western countries, in major emerging economies, such as China and India, salary and career advancement remain the most important job criteria. This is also true in the UAE. Around 20,000 millennials, aged 18-35, took part in the Global Shapers Annual 2016 Survey , which aims to gauge how young people see the world and what they want to do about it. Respondents from 187 countries and territories gave their views on issues relating to business, economy, politics, technology and values. The Global Shapers Community is a global network of Hubs developed and led by young people aged between 20 and 29, who are exceptional in their potential, their achievement and their drive to make a contribution to their communities.